Now that I have taken all the wallpaper off the 'orange room' (and for those that asked, I am not repainting the orange color on the walls) I can finally say that the wallpaper saga is over. I'd like to take this opportunity to recap all the removals we've been through in our home.....and I thought I'd grade them for 'ease of removal.' Because wallpaper should always be judged. And possibly graded harshly. This area did not come off without a fight, but it did come off. I would say this removal was a C.
And the paper extended all the way down the upstairs hallway, so that was fun. I'd give this area a D just for sheer annoyance and the death-defying location. It came off about the same as the entry. This paper came off pretty easy, some of it was in larger strips, too. I would give this removal a solid B because we didn't have to use any steam or sprays. 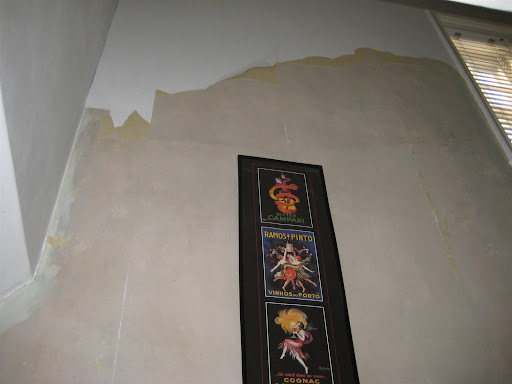 Yeah, wallpaper removal is a big FAIL when you have to re-drywall the entire room. But we added tall beadboard to the walls, so it all turned out great. Even though all the wallpaper isn't off, I still reserve the right to consider myself done with wallpaper. Who knows when (or if) I will get to this closet! The paper in this room came off like a dream, as you already heard. I obviously still have some little pieces to remove, but I would say this is as close to an 'A' removal as it gets. ~ It is best to lay down a tarp or dropcloth before removing the paper, because wet pieces will stick to your floors like you wouldn't believe. Don't skip this step! ~ Evaluate the paper you have. Some papers are thick and vinyl-like with a paper backing, some are thin and come off in tiny pieces. Removal methods are different for every type of paper. ~ Use a steamer to loosen the glue, using a scorer can help to get behind the paper, however it also makes it very hard to get large pieces off the wall. Use it when you absolutely have to! ~ Sometimes the paper's glue is so dried up you don't need to use any steam or spray, which really saves you from a nasty, sticky mess. Don't get it wet until you know you need to! ~ We do like DIF, but I have had success with fabric softener and water as well. ~ As you can see from my list, we used different methods for almost every room. Play around with the possibilities until you find what works best. ~ Most importantly, wash the walls like IT'S YOUR JOB when you have all the paper off. 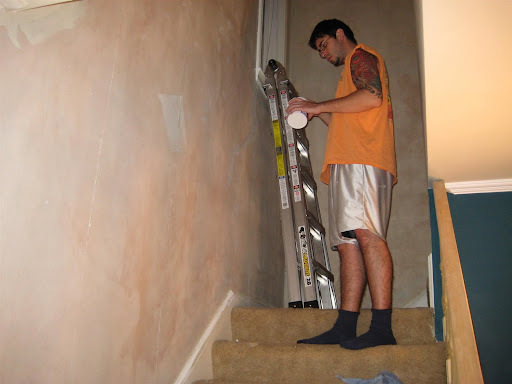 We washed all our walls with hot water and a couple drops of dish soap at least twice before attempting to prime, changing out the water often. If you don't, the glue can make your paint job streaky and go on funny. 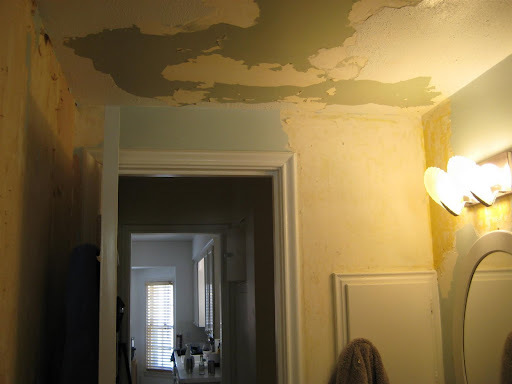 Of course, priming helps a lot, but it's still best to make sure you have a nice smooth, glue-free surface. Ugh! I hate removing wallpaper! Usually it's just hiding a bunch of fun stuff. 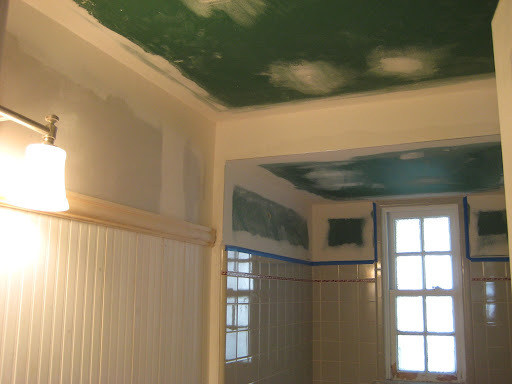 Our kitchen was wallpapered and boy, did that ever turn out to be a mess! Can't wait to see what you do with the room! This is perfect timing. I'm TRYING to motivate myself enough to not go out this weekend and make myself stay home and strip the wallpaper in the guest bathroom. The seams are already kind of coming off the walls and I tried pulling one last night and the top layer looks like it'll come off easily but it looked like the paper layer underneath might have to be worked on separately. Anyway, I'm rambling, but thank you for the tips! I've never removed wallpaper before and I've been avoiding it like the plague. I didn't even have to use the chemicals, just the soaking pads. Super clean! Wall paper is such a pain! We had to tear down the floor to ceiling wall paper in our attic bedroom already, and I've been procrastinating removal of the wallpaper border in our kitchen. Not fun. What a nightmare! Was there a room in your house that did NOT have wallpaper?? I hope I never have to do this. Can't wait to see what you do with the "whatever this room is" room! This is kinda scary considering that wallpaper is such a big trend right now... I'm sure it will all become dated and need removing again. What a mess! I'm exhausted just looking at the pictures :) You guys are a dynamic pair! OK, this is starting to freak me out. I swear that every time I have a project or am searching for something, you have the answer. Lee and I removed wallpaper this weekend (your blog once again had eerily good timing) and the walls underneath the cheap paper are unfinished and a total nightmare. 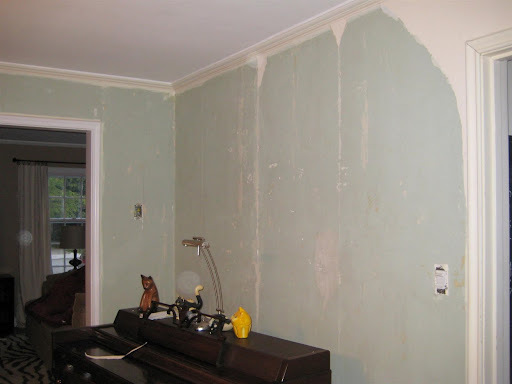 Like you apparently did, Lee thought of beadboard to cover the walls instead of investing in dry wall. Yours looks so good! But seriously. Are you my personal psychic or something?? Wow you have really tried all the methods! 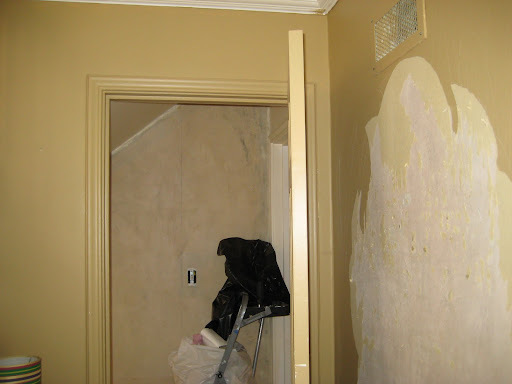 I agree that each piece of wallpaper is a little different in terms of removal. What a great tutorial!